A WSOP record 7 bracelet events were underway on Wednesday afternoon, three of them eventually reaching their conclusions. As noted in my report last night, Jason Mercier got some success in the US, taking home a bracelet in the $1,500 Pot Limit Omaha event, my report is up on PokerNews now. 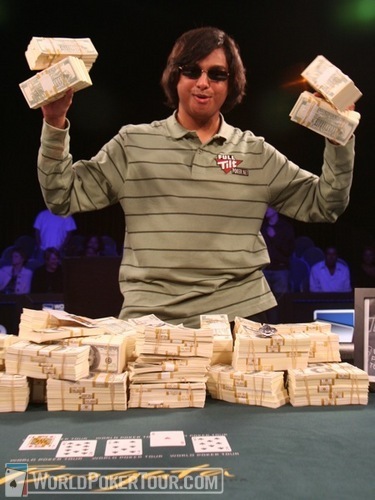 The $1,000 NL Holdem Stimulus Special was won by Steve Sung, taking home over $770,000 and his first WSOP bracelet. The very occasional PokerRoad blogger was under 1m in chips when play was 7-handed but went on a rush to take the chip lead in just under a blind level. Final table chip leader and occasional web page designer Dan Heimiller would finish in 6th place, one of many to succumb to Sung’s success. “Pete the Greek” Valindos was the final victim denied a chance at this 2nd WSOP bracelet, when his pocket eights weren’t good enough for Sung’s pocket kings, but Vilandos does have over $470,000 to cushion that blow. More details on how that final table went down will be up on PokerNews later today. The $10,000 7 Card Stud World Championship was a battle of the ages, literally. In what appears to be a record for a non-senior event, Freddie Ellis (74) bested Eric Drache (66) to take down the title as Ellis becomes the sixth African-American (Phil Ivey, David Williams, Walter Smiley and Carolyn Gardener being the other five) to win a WSOP bracelet. As Nolan Dalla noted in his tournament report, the distinction all six players have is that they each have won a bracelet in seven card stud. Here’s a bonus piece by Benjo on Eric Drache, from the Tao of Poker site. The $1,500 NL Holdem event wasn’t able to reach their final table, as 33 players were left at 3am. They get to return at 1pm today to play down to a final table. This final table was scheduled to be streamed later this afternoon at bluffmagazine.com, but that’s definitely not happening at the scheduled 2pm start time. Follow them on Twitter for the latest updates on that situation. Notable names remaining: Michael Martin, Francois Safieddine, and Jeremy Joseph. One final table that is known is the $2,500 NL 2-7 Lowball Single Draw event. When play began Tuesday afternoon, there were several big names among the 35 remaining. Those players all fell by the wayside, except for Phil Ivey, here’s how the final table will look when they come back at 2pm today. The $1,000 NL Holdem Stimulus Special finished at 3am today with 50 players returning at 1pm to play down to a winner. The chip leader is Robert Comegys from Grand Prairie, TX with nearly 1.2m million in chips. Danny Fuhs is close behind, with notables such as Eric Mizrachi, Lee Watkinson, Dan Heimiller, and Jonathan Aguiar far down the leaderboard. More details will be available in my PokerNews recap later today. Today’s event is scheduled to be the first of over 20 WSOP final tables to be streamed online this year. The scheduled 2pm final table will be pushed back at least a few hours, depending on how fast play is today. Updates on Pokerati during the day today. The $1,500 Pot Limit Omaha event finished their Day 1 with 81 players remaining, the exact amount needed to reach the money. Jason Mercier, best known for his success on the European Poker Tour, is the chip leader with 227,000 in chips, over 60,000 more than second placed Matt Humphrey. Other notables who’ve made the money include Eric Froehlich,, Dario Alioto, Josh Arieh, An Tran, Warren Karp, Shannon Shorr, Robert Mizrachi, and Kirill Gerasimov. Those players and many more return at 2pm today to play down to a final table. The $10,000 Seven Card Stud World Championship ended after eight levels with 101 of its remaining 142 entrants remaining. High-stakes cash game player David Oppenheim emerged as the chip leader, with veterans “Miami John” Cernuto, Nick Frangos, Danny Robison, and Steve Zolotow helping make up the top 10. Others who’ll be looking to work their way up include Eli Elezra, Todd Brunson, Eric Drache, Erick Lindgren, Andy Bloch, Cory Zeidman and Phil Ivey. They also return at 2pm to play down to their final table. The one event that was able to conclude Monday was the WSOP Champions Invitational as Tom McEvoy, the 1983 Main Event winner, knocked off Robert Varkonyi, the 2002 Main Event champion to win the first Binion Cup along with a 1970 red Corvette.